One of the Best Ways to Improve Your Dressage Scores is to Develop an Elastic Contact From Your Hands to the Horse's Mouth Here's how it's done. "More forward", the trainer called. So Jane squeezed her legs harder, tapped her horse with her whip, and even kicked. But her horse's gait just didn't change. In fact, he pinned his ears and ground his teeth. Because the problem wasn't that he was lazy or that Jane wasn't using her legs aids properly. The problem was her hands. ​No horse will willingly go forward into a rigid, fixed, twitchy, loose, or otherwise unfeeling contact. Kick and tap all you want. It won't matter. But a horse will willingly and happily go forward into a feeling, elastic contact. In fact, he will seek contact with your hands. And that is the secret to moving upward and onward in your dressage training. Follow these simple steps to develop an elastic contact, and improve your scores, and make your horse softer, more energetic, and (sigh!) happier during his dressage horse training sessions. THE BASIC HOLD: First, check how you are holding your reins. The photos above show you the best grip for establishing that “stretchy, elastic-contact” that top dressage riders talk about. Notice that the wrists are straight and flexible, allowing the hands to close into gentle fists. Notice also that in the hands are “facing each other” like bookends. 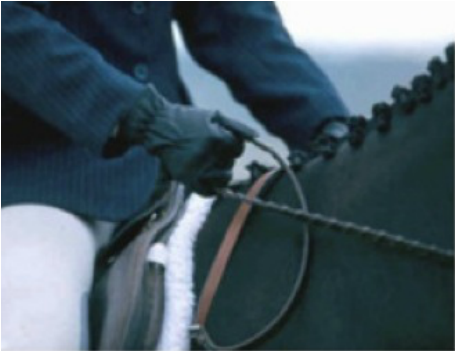 The ring fingers “feel” the horse’s jaw, and the thumb holds the reins in place by pressing down on the index finger. When you squeeze your hands, your little finger will come closer to the underside of your wrist, and you will feel more pressure in your ring finger. That is all you need to do to soften the horse’s jaw. If you’re holding your reins any other way, you’re making your job harder for yourself. Most top riders hold the reins this way because it makes establishing an elastic-contact easier to accomplish. So now you have a visual image of what your hands should look like, but how should they feel? How do you know how much pressure you need? How do you know if you have an elastic-contact? ​THE SINGLE PERSON EXERCISE: Hold a single rein (or a belt that is about the same weight and thickness as a rein) in both hands, as you would while riding. Then turn your hands so that the knuckles face each other. Pull your hands apart until the belt is taut and each hand feels the other. Close your eyes and experiment with pulling your hands apart and pushing them closer together. When you pull them apart, you will feel a good deal of tension and pressure in your hands, particularly the ring finger. This is what if feels like when your horse “leans” on your hands. When you push your fists closer together, the contact will become “wimpy” or will be lost entirely. This is what it feels like when you don’t take enough rein contact or your horse ducks behind the bit. Try to find the “feel” in your hands that is “just right”. You’ll recognize it when each hand can feel the other without any “pull” or “tension” in the contact. This is what the bit feels like in your horse’s mouth when you have “elastic-contact”. If you get it just right, it will feel as though an energetic channel suddenly opened up between your hands. Your horse will LOVE this contact and will try to reestablish it whenever you intentionally or unintentionally lose it. Try turning your hands palm down, and you may be unpleasantly surprised as how “dead” your hands suddenly feel—and how much this way of holding the reins causes you to pull rather than “feel” or squeeze. If you were a horse, wouldn't you prefer your rider to have an elastic-contact? Now, with your eyes closed, try slowly moving one hand up and down, to and fro while the other tries to re-establish that elastic-contct. After a while of practicing this, your hands will move together in concert as they instinctively try to keep that wonderful stretchy feel. Speed your movement up a bit and practice trying to maintain that contact no matter where your hands travel through space. This is what it feels like to have a horse seeking your hands, and it is also what its like to re-establish and maintain an elastic-contact with an untrained horse’s mouth. THE TWO-PERSON EXERCISE: Now to the tricky part: Give one end of the rein to a partner, and do all of the same exercises. Your goal is to establish an elastic-contact with your partner’s hand in the same way you did with your own two hands. This is not only an instructive exercise that transfers well to establishing an elastic contact under saddle, it is also good for more than a few belly laughs! SEEKING THE BIT: Once you can maintain an elastic-contact no matter where your partner moves his or her hand, try to establish that same “feeling” contact when you’re in the saddle. You may be pleasantly surprised to find that your horse constantly seeks to re-establish elastic-contact with your hands. If you move your hands slightly forward, your horse will push his nose out to try to find your hands. If you squeeze your ring finger and draw your hands back slightly, he will flex at the poll and soften his jaw so that that “tight” feeling disappears and the “stretchy” elastic-contact feel is re-established. THE GAITS: Now put some polish on your riding. Notice that when the horse walks, he uses his head and neck. Your hands must follow this movement. Now you don't need to guess at how and when to move your hands. Instead, just focus on maintaining the same elastic-contact--the same "feel"--as your horse walks. Your hands will move exactly when and exactly how they need to move in order to accomplish that. The same at canter--the horse needs to move his head and neck. Just focus on maintaining the same "feel" in your hands, and they will move exactly as they need to to keep your horse connected, through his back, and driving from his haunches. At trot, things are much easier because the horse doesn't move his head and neck. Just focus on keeping your elastic feel, and your hands will be exactly where they need to be--even when posting. THE PERFECT EXTENSION: How to make your horse do that lovely extended trot or canter? Nothing could be easier for you now. Just push your hands forward slightly. Your horse will stretch his neck to re-establish that elastic-contact with your hands. As he stretches his neck, he will also lengthen his body and hence his stride--without increasing his pace. To collect him again, just do a half halt. THE PERFECT HALF HALT: Now the final touch: If you squeeze the reins this way while lengthening your torso and tightening your lower back and abdominal muscles, you will execute the perfect half halt. Your hands provide an elastic wall in front while your back and abdominal muscles shift the horse’s energy back onto his haunches so that he drives from behind. Practice these exercises often, and you will see the result in the quality of your riding, your dressage scores, and your horse’s comfort under saddle. Riding will become a pleasure for both of you! Read more about that the perfect half halt here. Read more about lengthening and extending your horse's gaits here. your dressage tests is to draw them. These high quality dry-erase arena boards have drawn-to-scale dressage arenas imprinted on them. Draw your test using a dry erase marker, wipe clean, and draw again until your test is letter perfect in your mind's eye! Then ride your test! Read what the experts say about drawing your tests here.